Twenty Years and Counting! – Our Continuing Tryst with the H-1B CAP • Kidambi & Associates, P.C. Each year is different, and this one may be the last when it comes to the present format. The USCIS is changing the H-1B CAP for next year. Employers will no longer be required to file entire petitions to be considered for the CAP next year. Obviously, the program was shelved, and we heard nothing about this until the current administration took over. On January 31, 2019, DHS posted a new rule (to go into effect April 1st) changing the process by which CAP petitions will be selected and adjudicated. 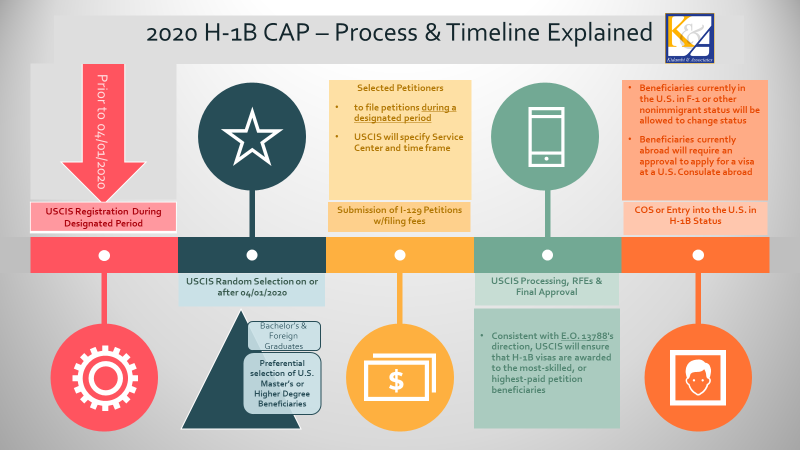 Although suspended for this year, USCIS has introduced an electronic registration requirement for petitioners seeking to file H-1B cap-subject petitions next year. Another important change that will actually go into effect this year, is in the way advanced degree holders will be selected. USCIS will first select H-1B petitions (or registrations, from next year) submitted on behalf of all beneficiaries, including those that may be eligible for the advanced degree exemption. The Service will then select from the remaining eligible petitions, a number projected to reach the advanced degree exemption. USCIS hopes that this will likely increase the number of petitions for beneficiaries with a master’s or higher degree from a U.S. institution of higher education to be selected under the H-1B numerical allocations. Specifically, the change will result in an estimated increase of up to 16% (or 5,340 workers) in the number of selected petitions for H-1B beneficiaries with a master’s degree or higher from a U.S. institution of higher education.